THE GREATEST GIFT The Greatest Gift celebrates over seventy years of Christmas with Coca-Cola. Replete with magical imagery and a truly resplendent Santa Claus, the 60-second spot visits and revisits an ever-changing village and a little girl growing into adulthood. The brainchild of ad agency Mother London, the spot was directed by Kerry Conran of production company Looking Glass and director of the feature film, "Sky Captain and The World of Tomorrow." Much of the animation was created by Framestore NY, the North American branch of Europe's largest visual effects and animation company. 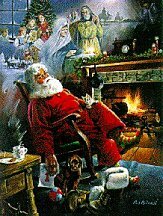 Santa exists somewhere between fantasy and reality. He is this huge presence as he strides through the little town, but it is only this little girl, and eventually her family, who can see him.The spot opens over rooftops covered with softly falling snow. Beneath a full moon and on the streets of a warm-looking and bustling little town, Santa suddenly materializes on the 1930s era streets. He approaches a toy store window, where an impeccably dressed little girl gazes longingly at a miniature town inside the store window. 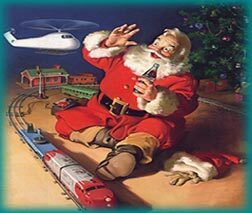 Turning to greet Santa, he hands the lucky young girl a bottle of Coca-Cola, before disappearing into the little toy town. As decades pass, Santa continues to walk unnoticed through the snowy streets of the little town, eventually meeting up (in 1954) with the same girl, now a young woman, as she ice skates. Handing her two bottles of Coke, she bumps into her future husband. Skipping smoothly through the years and into the 21st Century, we see Santa approach the same toy store window, only to have someone tap him on the shoulder. 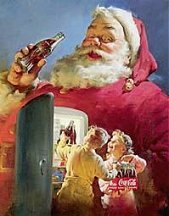 Our young woman is now a mother to a teenager, and this time they both hand a still-smiling Santa a Coke. The small village setting is actually based on a popular tourist attraction in the Netherlands. Madurodam, a strikingly intricate miniature village, is essentially a minute replica of old Amsterdam on a 1:25 scale. For previsualization purposes, Framestore performed a Lidar scan of the tiny village that resulted in 50 3D models that had to be pieced together. The modeled buildings, 250 props, and nine vehicles were covered in CG snow. All the falling snow was also created in CG, together with the stunning shot of the ice skating rink. Matte paintings were also created for almost every shot using. In recreating the face of Santa Claus, actor Ken Howard (The White Shadow) was made to resemble the character in the old Coca-Cola ads painted by artist Haddon Sunblom. comes from none other than Coca-Cola. 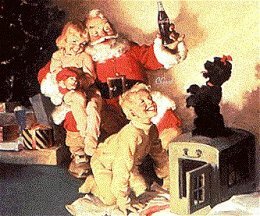 Santa is all about Coke. No joke. 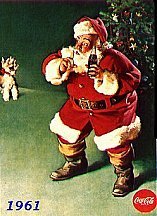 Fat and jolly Santa with the red suit and cap, thick black belt, sooty boots, rosy cheeks, luminous eyes and brighter-than-white teeth is the product of a genius advertising campaign created by Coca-Cola in the 1930s. 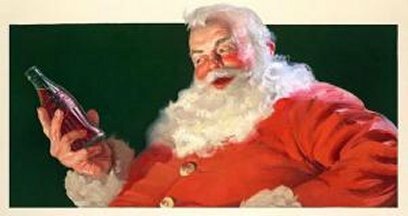 Now, before you go off in a huff and hide this article from Santa-believers, please keep in mind that it's no secret our revered Claus is corporate-sponsored. Coca-Cola remains out of the closet about its role in popularizing Santa. 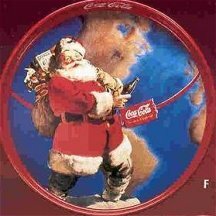 The company is so proud that it has documented the creation of the Coca-Cola Santa in a gallery exhibition called "Advertising As Art," which ran at the Louvre in 1996. 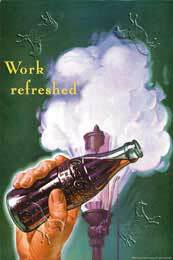 In the late 19th century, when Coca-Cola first started selling Coke, the beverage was touted as a tonic. The company promoted the featured ingredient of cocaine, or coca bean extract, which it said guaranteed a renewed self--one with greater agility and acuity. Coca-Cola paid pharmacists a commission for the sale of this medicinal beverage if drug stores allowed Coca-Cola to install a carbonation tap on the premises. In the 1930s, Coca-Cola needed to re-evaluate its business prospects and consider how it was going to survive the Depression. 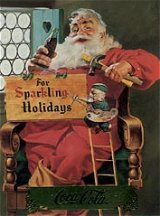 The more controversial aspects of the beverage had been resolved (as early as 1903, coca extract was removed and caffeine took its place). Beverage sales were slowing down--especially in the winter months. 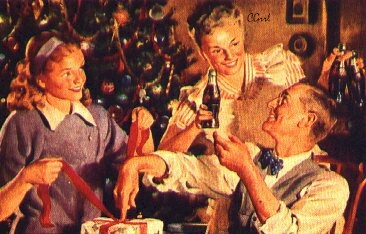 In 1931 Coca-Cola expanded its target audience from the adult who lacked pep to all family members who required cheer and joy. Coca-Cola was a great taste to be enjoyed by everyone! The company decided to launch an extensive advertising campaign to demonstrate its new appeal. Pioneering the use of well-known artists to design ad campaigns, Coke blitzed pharmacies and stores with promotional material. The illustrations by one artist in particular, Haddon Sundblom of Sweden, took off. 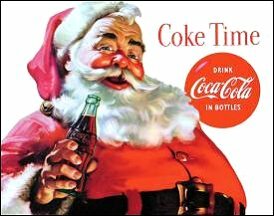 He portrayed Santa as a portly white man in a red suit bringing joy to families and friends simply with a bottle of Coke. It's this version that we now see in shopping malls, greeting cards, commercials and Salvation Army booths around the country. 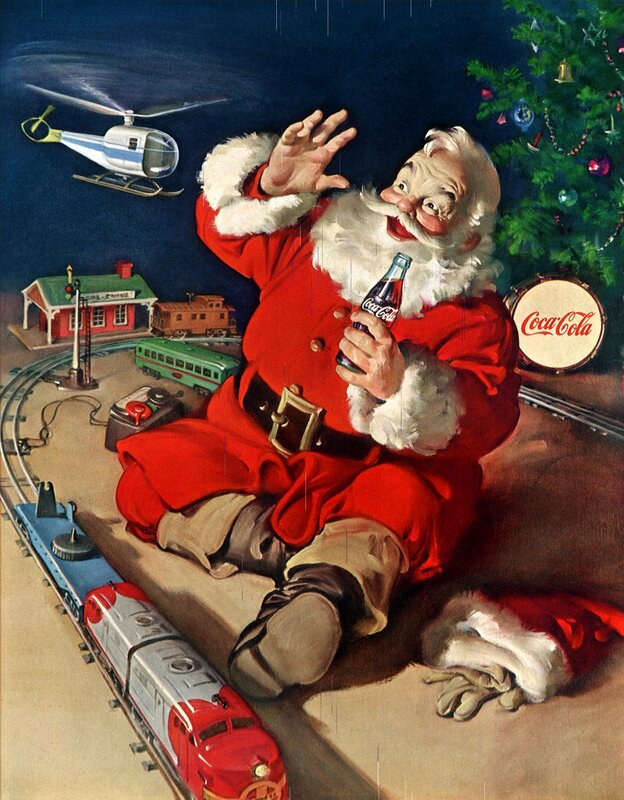 But Coca-Cola cannot be fully credited for bringing Santa into the homes and hearts of Americans. 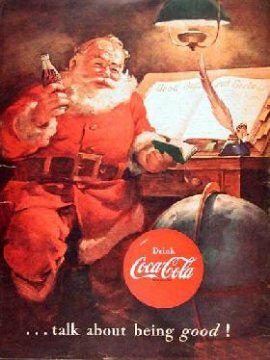 The history of Santa Claus, the mystery gift-giver, goes back well before the time of the Coca-Cola company. 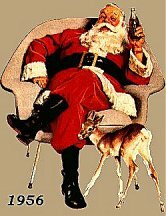 In previous incarnations, Santa wore no red suit. 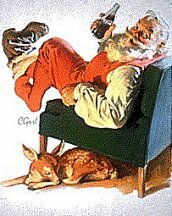 Santa's varied cultural roots include the fourth-century bishop of Asia Minor; a Scandinavian dwarf or goat; the white-robed Kolyada, a pre-revolutionary Russian girl who arrived atop a sleigh with accompanying carolers; and the many religious gift-bearers associated with the Magi. 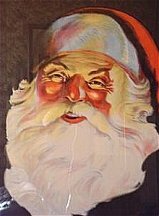 In each of these Old World depictions of Santa, his costume bears no stain of red. In the United States, the Dutch were primarily responsible for spreading the idea of Sante Klaas, who was based on one of their revered bishops. Sante Klaas gave form to the current myth of Santa and fleshed out his reputation as a gift-giver. 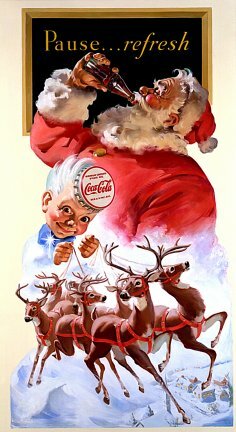 However, the visual image was not honed until much later, when Coca-Cola created its Santa. 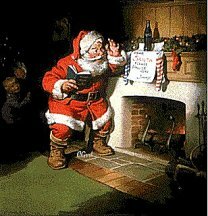 In 1822, an American professor, Dr. Clement Clarke Moore, wrote The Visit of St. Nicholas, which is known today as the The Night Before Christmas. 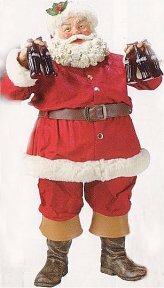 His description of Santa suggests a fat man, but in the gnomish fashion of the earlier European versions. The poem reads: "His eyes how they twinkled! His dimples how merry!/His cheeks were like roses, his nose like a cherry/His droll little mouth was drawn up like a bow/And the beard on his chin was as white as the snow.../He had a broad face, a little round belly/That shook when he laughed, like a bowl of jelly./He was chubby and plump, a right jolly elf...."
Nearly 40 years later, political cartoonist Thomas Nast drew St. Nicholas for Harper's Illustrated Weekly. This version wears a woolly, furry suit and resembles a stout, bearded elf; the Sundblom look is not apparent. 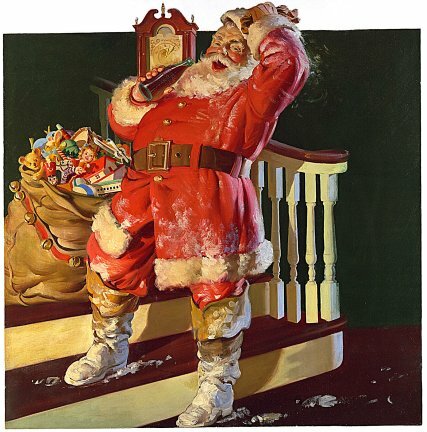 Nast often created etchings in black and white featuring elements that presaged the Coke Santa (i.e., the belted suit). 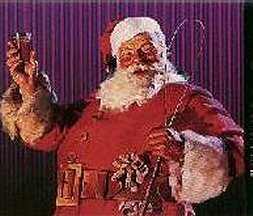 However, in Nast's color renditions, Santa vaguely mirrors the modern, commercial image--except the bright-red color is missing. Here's where the genius of Coca-Cola comes in. 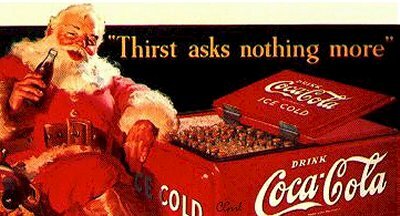 First, Sundblom's image of Santa Claus hit the right buttons in terms of stirring the hearts and quenching the thirst of consumers everywhere. 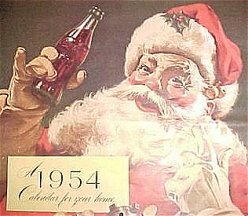 Modeled on a retired salesman named Lou Prentice, Sundblom's Santa had just the right combination of happy wrinkles, prompting Coca-Cola to hire Sundblom to create Coke ads using this model over the next 35 years. Also, Coca-Cola orchestrated an attack on the market with Santa-Coke propaganda. Magazine advertisements were particularly effective, considering that during that era, print publications had the influence TV does today: They were able to communicate over and over and over again the same image and slogan to a mass audience. Point-of-purchase promotional items were extremely common. Collectibles were another way Coca-Cola expanded its presence--a strategy that is standard today for many advertisers, from Nike to Joe Camel. 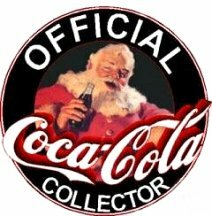 Finally, Coca-Cola patented a particular shade of red--that bright red used for Coke packaging and for Santa's suit. All of the artists hired to work for Coca-Cola were required to use this shade of red, influencing consumers, no doubt, to make the constant association between red and Coke and Santa. This is perhaps the biggest kicker, considering that there is little consistency with regard to the color of Santa's suit between Nast's version, Moore's literary image and early European portrayals. 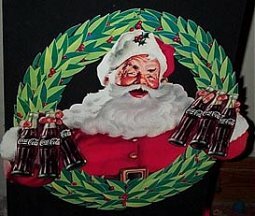 These days, the sacredness of Coke's Santa has expired. 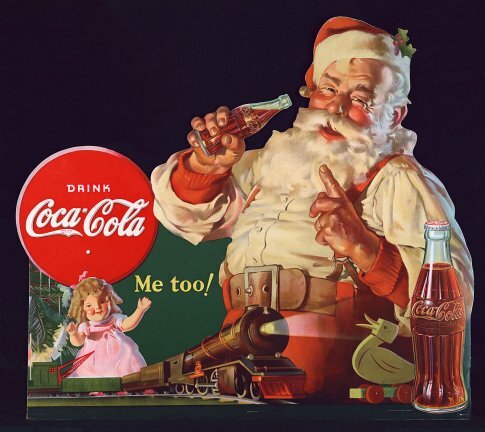 Santa is ubiquitous, Coke is ubiquitous, but no one really remembers that the two were at one time closely entwined. It's a history that is mostly understood by public relations advisers and college marketing students, and maybe the slew of museumgoers who saw the "Advertising as Art" exhibit at the Louvre. 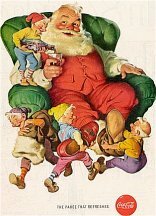 Sometimes Coca-Cola revives Sundblom's Santa in a commemorative appeal to its loyal consumers, but the story is rarely told. 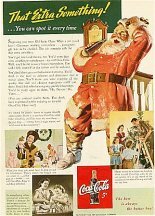 As Mark Pendergrast, author of For God, Country and Coca-Cola, concluded: "Prior to the Sundblom illustrations, the Christmas saint had been variously illustrated wearing blue, yellow, green, or red...After the soft drink ads, Santa would forever more be a huge, fat, relentlessly happy man with broad belt and black hip boots--and he would wear Coca-Cola red...While Coca-Cola has had a subtle, pervasive influence on our culture, it has directly shaped the way we think of Santa." 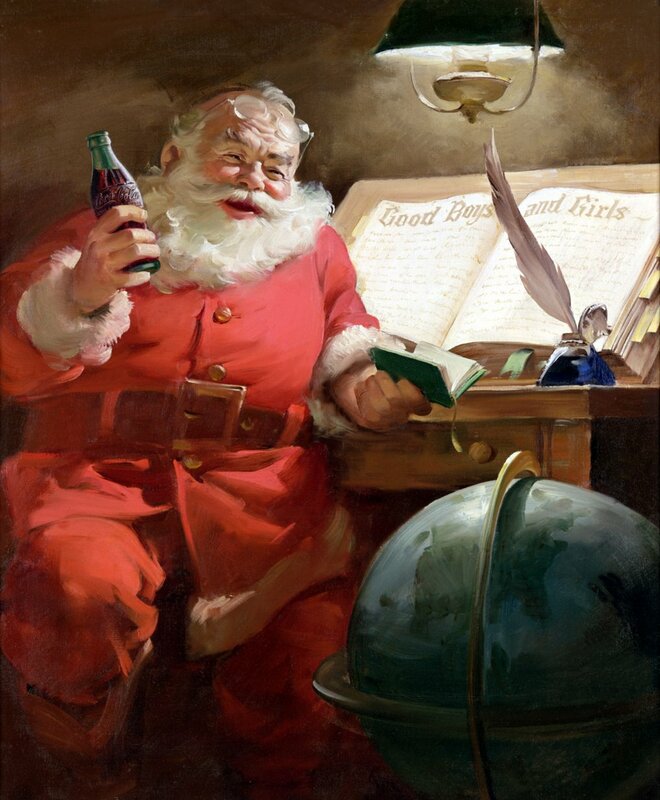 Starting in 1931, Coca-Cola first used Haddon Sundblom’s Santa Claus for its Holiday Advertising. 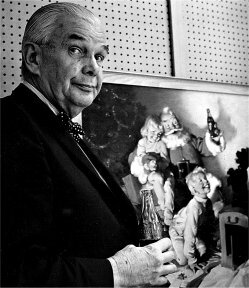 It has since grown into an American Christmas Tradition to the point of it becoming a pop culture icon. It evolved from print advertising to Coke Bottles and various other items that have become collector’s items. 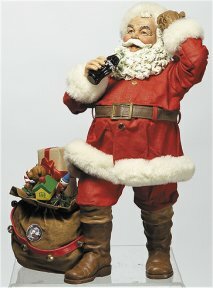 In 2005, Haddon Sundblom’s Coca-Cola Santa is nowhere to be found on any of its advertising, bottles, etc. Instead, it’s the Coke Polar Bears. 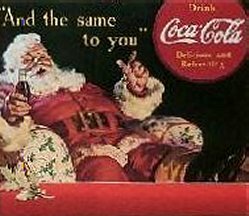 There’s nothing wrong with the Polar Bears but it’s obvious that Coca-Cola has thrown away 74 years of tradition for the sake of Political Correctness in NOT having The Santa. 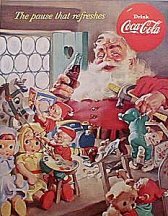 Note: We previously directed visitors to this page to an online petition that encouraged the Coca-Cola company to bring back Santa in their Christmas advertising. 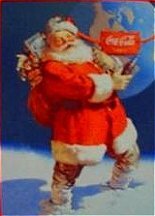 This year, 2006, I've received a letter from a Coke representative in Atlanta stating that their traditional Santa images have been reinstated in the Coca-Cola advertising. Thank you, Coca-Cola . . . and a big thank you goes out to helped with the petition. 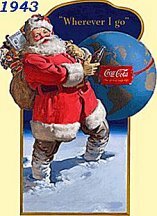 Christmas Santa 2006 Red Coca-Cola Bottle 6-Pack with Carton Celebrating the 75th Anniversary of Santa created by Haddon Sundblom for the Coca-Cola advertising campaign, Thirst Knows No Season. 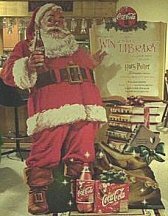 This special edition collector's Coke bottle features a Santa image with 75th Anniversary Sundblom Santa on a red label Coke bottle in a beautiful holographic carton. 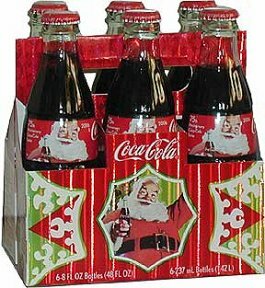 One of two Coke bottles issued for Christmas 2006. 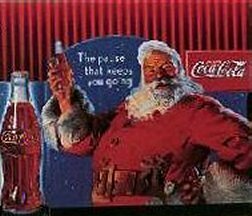 Coca-Cola has revealed its UK Christmas advertising campaign, featuring its classic Santa Claus character. directed by Hollywood film director, Kerry Conran. Conran's last production was "Sky Captain and The World of Tomorrow." based on Edgar Rice Burroughs' first novel, the SciFi classic, "A Princess of Mars." under the title "John Carter of Mars"